To open the fall season, Cheim & Read will present an exhibition of new paintings by Richmond Burton. 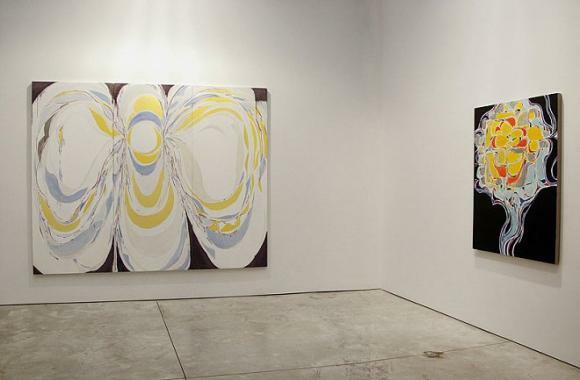 This will be Burton's first New York show since his 2001, when he exhibited his exuberant series of paintings, "I Am," at Cheim & Read. Though some paintings in the forthcoming show continue in that vein, most depart from it to re-explore or re-interpret earlier aspects of his work, specifically the painted grid. Many of these new gridded paintings are oriented to a predominantly horizontal line, rather than vertical as in the past, lending them the expansiveness of landscape or seascape. In other paintings, Burton returns to a black-and-white palette that is somewhat reminiscent of the monochromatic black paintings that first brought him wide attention in 1989. "I wanted to take a break from color," he said recently, "and I've gone back to color with a new, or a renewed, relationship to it." In 2002 Burton completed an important public commission in Birmingham, Alabama (his home state), a 13 by 20 foot quadriptych entitled "Creating Peace." This has led to another group of new paintings in which single, biomorphic images are dominant, in contrast to the overall, episodic grids and arabesques Burton has been known for in recent years. Speaking of the diversity of his new paintings and their relationship to earlier work, Burton says, "They often branch off from one another, and I'll see possibilities in one painting that I'll choose, later, to pick up on-that road that I diverged from." For additional information please contact Cheim & Read by calling 212/242-7727, faxing 212/242-7737, or emailing gallery@cheimread.com.